Money Maker, one of the rarest albums in legendary reggae label Studio One's catalog, has just been reissued in LP/CD and Digital formats. Featuring a more overt soul and jazz sound for Studio One, the album is comprised of mostly instrumentals of early Studio One tracks made famous by groups like The Heptones, The Wailing Souls and John Holt. 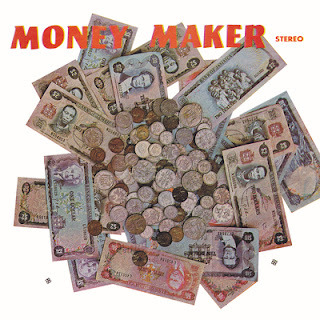 Money Maker features performances by Studio One house bands, The Sound Dimension, The Soul Brothers and The Soul Vendors joined by Im and David, guitarist Ernest Ranglin, Lloyd Williams, Jackie Mittoo and "The Boss" himself, Coxsone Dodd. The original 1970 release was pressed in limited quantities and remained out of print until 2002 when a limited edition including extra tracks was released. Remastered from the original session tapes, this reissue is presented with it’s original track listing and iconic “cash” cover. Kicking off the reissue campaign on May 27th were The Wailers and their debut album The Wailing Wailers featuring Bob Marley, Peter Tosh and Bunny Livingston, reviewed in Pitchfork. Future releases include the never before released Studio One Radio Show featuring beloved host, Winston "The Whip" Williams, a Don Drummond collection and a "House of Joy" box set to celebrate the label's over 60 years of existence.